Lemonthyme Cottage - Peace, Serenity. Did we mention the Views? 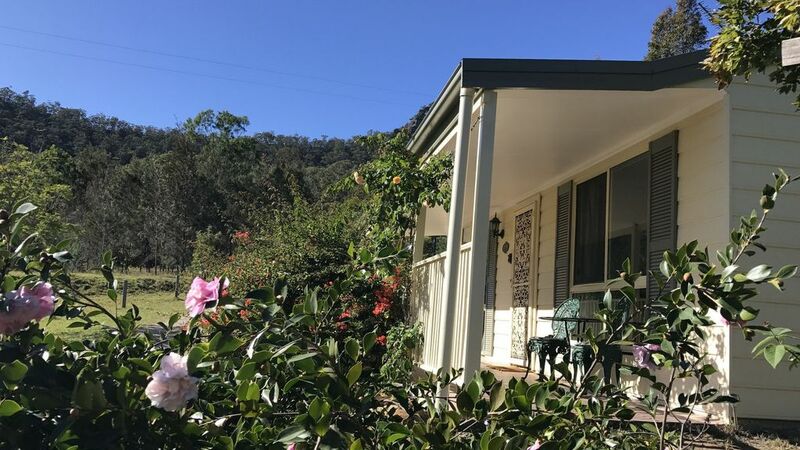 Nestled on 25 acres in the foothills of the Pokolbin State Forest with stunning views across open paddocks to the Brokenback ranges beyond, Lemonthyme cottage accommodates up to six people in a light and airy self-contained two-bedroom cottage. Less than 2 hours from Sydney you will have everything you need for a romantic getaway or to spend time as a group with family and friends. Just moments from your door are Hunter Valley cellar doors, restaurants, olive groves, concert venues, and golf courses. The cottage comes equipped with a full kitchen, reverse air-conditioning, TV, video and CD player. Freshly laundered towels and bed linen are included, as are initial supplies of tea, coffee, sugar, salt and pepper. A selection of books and games are available, as well as an outdoor setting with gas BBQ. This is a 2 bedroom home offering bedding up to 6 guests. Linen Supplied - This property supplies all linen - full bed linens and 1 bath towel per person. Guests may wish to bring extra towels depending on the length of their stay. The property was located in farmland and was on of two cottages. I loved the seclusion yet we were close to wineries. The scenery was just lovely. Clean, comfortable and everything we needed for a relaxing two days. While it should be noted that there are three Wollombi roads in the Hunter Valley, once we arrived at the house, it was clean, conveniently located and peaceful. Comfy beds and two heaters. Everything you could need for a nice weekend away. A great place to escape to from the "rat race". The cottage was beautifully presented, with everything we needed for our stay. Would recommend it for anyone wanted to get amongst nature. Plenty of space for the kids to run around and have a great time too. We loved our stay...the property and people made it an exceptional service and we couldn't have been looked after any better during our time in the hunter. Absolutely would recommend again! An excellent property for those who want to relax and take in all that nature has to offer. it's about 20 minutes from Pokolbin which some may find inconvient after wine tasting but it's well worth the stay as it is only you and you. This is a very clean property and it seemed brand new. Eden the property manager is very courteous and helpful. I will definitely consider it for future visits! Had a lovely weekend with friends in this great little cottage. Everything you need in a beautiful, peaceful location.